It’s my observation that the average fly fisher does not understand and utilize the varied opportunities to fish emergers. Emergers are an important part of a trout’s diet, especially for large trout reluctant to come to the water’s surface. Their presence heralds the onset of a hatch, and they continue to be present throughout a hatch. In this article, “Fly Fishing Emergers”, I’ll explain what an “emerger” is, how to tie imitative fly patterns, and how to fish them. The term “emerger” can be a bit confusing, as it is not an actual stage of an aquatic bug’s lifecycle. Rather, it is probably best thought of as a descriptor of the behavior of the bugs. Specifically, the bugs are trying to emerge from their aquatic world into a world above the water. For bugs that undergo complete metamorphosis, it is the pupae. For bugs that undergo an incomplete metamorphosis, it is the nymphs. In both instances, they have reached maturity within their respective stages. To begin the next stage of their lifecycle, they must reach and break through the water’s surface. To assist with their ascent to the surface, both pupae and nymphs generate gases which are trapped within their exoskeletons and provide buoyancy. They then swim upwards to the water’s surface, where they try to break through the surface film. The surface film acts like a sheet of cellophane paper floating on the water’s surface. In order to break through it, they must generate sufficient momentum or force. Such force is proportional to their size or mass, and the speed with which they can swim. Thus the larger, faster bugs, such as caddisflies, are more successful, while smaller, slower flies, such as midges, are less successful. Doug Swisher and Carl Richards studied the phenomenon of emergence in a number of aquatic insects. Pupae and nymphs were netted, placed in aquaria, observed and photographed. Their observations were published in 1991, in “Emergers“. Among their many important observations, they noted that mayfly nymphs were often trapped by the surface film for as long as five to fifteen minutes before they were able to break through. Overall, successful emergence occurred only about fifty percent of the time. Let’s look more closely at the three major groups or orders of aquatic bugs that emerge by swimming to the water’s surface, beginning with caddisflies. Caddisflies undergo a complete metamorphosis, and it is therefore the pupal stage that emerges. The pupa is fairly bulky and has long legs which it uses for swimming to the surface. The gas trapped within its exoskeleton gives it buoyancy and a shiny or sparkling appearance. Its swimmer-legs allow it to reach the stream’s surface quickly, with enough momentum to break through the surface film with greater success than the mayfly nymph. Adult caddisflies have hydrophobic wings which do not absorb water. Therefore, after the pupal exoskeleton splits at the water’s surface, the adult caddisfly is able to emerge and take flight almost immediately. Thus the adult offers only a limited opportunity for feeding trout. Consequently, trout focus on the pupae swimming to the surface. They often take them with slashing, surface-breaking gulps, giving the impression that they are feeding on the surface. Imitative flies of the pupae should have two, important characteristics. One is a shiny or fluorescent body to imitate the trapped gases. The second is long, leg-like appendages that pulsate in the water column, to imitate the swimming motion of the pupae. 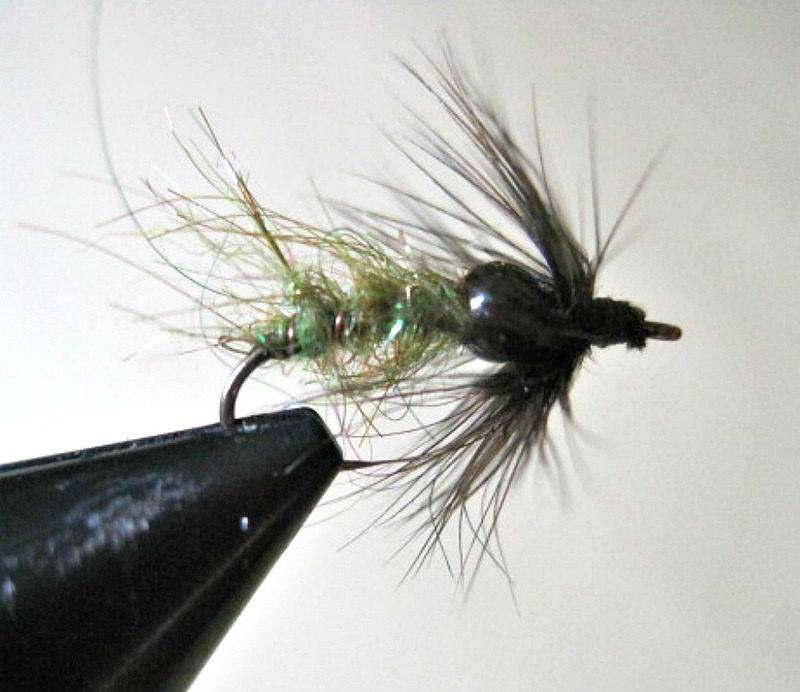 Below is a picture of one of the patterns that I like to tie. It has an abdomen of fluorescent dubbing ribbed with wire, and a tungsten bead for the thorax. 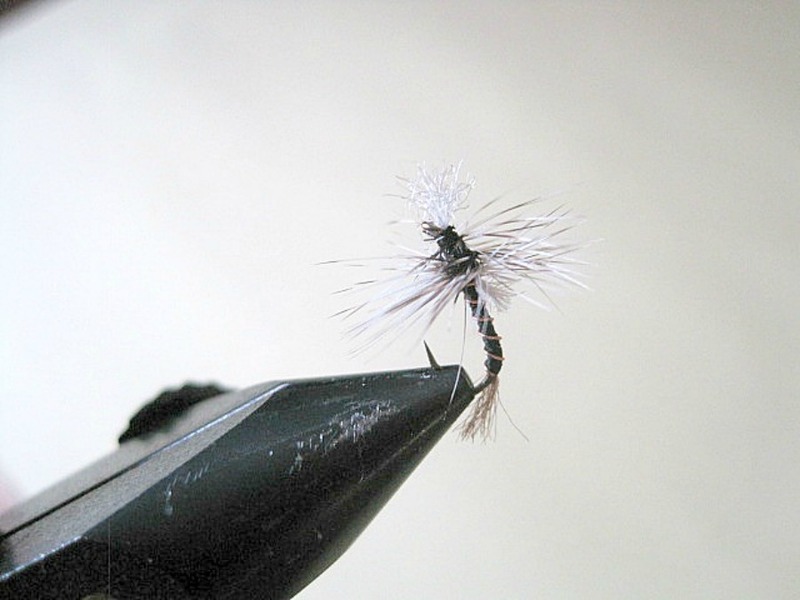 Two or three turns of hen-hackle are tied ahead of the bead to imitate the legs. It can be fished like a traditional wet fly, swung downstream and brought to the surface at the end of the drift, simulating an emerging pupa. Another technique is the Leisenring Lift. The fly is cast across-stream, and a series of lifts are made throughout the drift to imitate repeated efforts to reach the surface. It is important to lift the fly upstream, as the pupae swim upstream to the surface. In contrast to the caddisfly, mayflies undergo incomplete metamorphosis. Therefore, it is the nymph that emerges into the above-water world. The mayfly nymph is not as well prepared for this as is the caddis pupa, lacking the caddis’s large swimming legs. After gathering gas under its exoskeleton, it tries to swim to the surface with an undulating motion of its body. There is a frequent failure rate, and many of the nymphs will drift downstream, resting just below the surface film. During a hatch, there are more emergers present in the film than duns on the surface. In addition, they are more vulnerable than duns, which are poised to take flight. Thus trout select emergers in preference to duns, especially the large, shy hogs of our dreams. Imitative flies should have a shiny or fluorescent body, with small legs in the thorax region. The swimming motion is best imitated with articulated flies. 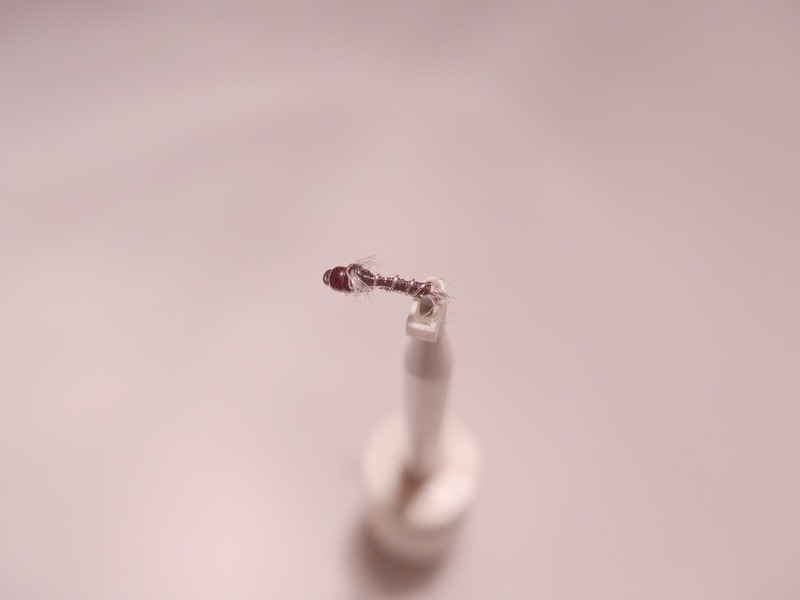 But for those of us with more limited fly-tying abilities, there are now “swimming-nymph” hooks. They provide an undulated shape to the fly. Below is a picture of a mayfly nymph tied on a swimming-nymph hook to imitate an emerging mayfly nymph. Whether fishing an articulated nymph or one tied with a swimming-nymph hook, the techniques used to imitate a rising nymph are the same as those described above for the caddisfly emerger. But another approach to fishing mayfly emergers is to imitate the resting nymph, trapped just below the surface film. When resting, they are rather inert. Therefore, they can be fished dead-drift, either alone, or dropped off a dry fly. Two patterns that I like to fish are shown below. On the left is a pattern tied “Quigley style”. The abdomen hangs vertically in the water column, while the thorax and post protrude above the water. 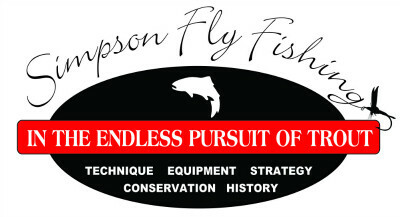 The post increases its visibility to the fly fisher. The pattern to the right is lightly weighted with a glass beadhead, and drifts just below the water’s surface. I fish both in tandem with a dry fly imitating the dun. When fishing the Quigley pattern, I use 18-24 inches of tippet, tied eye to eye. When fishing the beadhead pattern, I use only a short bit of tippet, ten inches or less. I attach it to the bend of the dry fly hook. Often, when a trout takes this emerger, it will make a sharp, rolling turn, revealing its pale abdomen. This is visible as a brief flash very near the dry fly. The hook must be set immediately, or the trout will spit the hook and be long-gone. Otherwise, the dry fly acts as an indicator, and the hook should be set with any interruption of its drift. The last group of aquatic bugs that is available to trout when emerging at the water’s surface is the midge. This diminutive fly undergoes complete metamorphosis, similar to the caddisfly. However, due to its small size and the unbroken surface film on the quiet waters that it typically inhabits, it has a very high emergence failure-rate. During a hatch, most trout will completely ignore the winged adult, and feed exclusively on the pupae trapped just below the surface film. 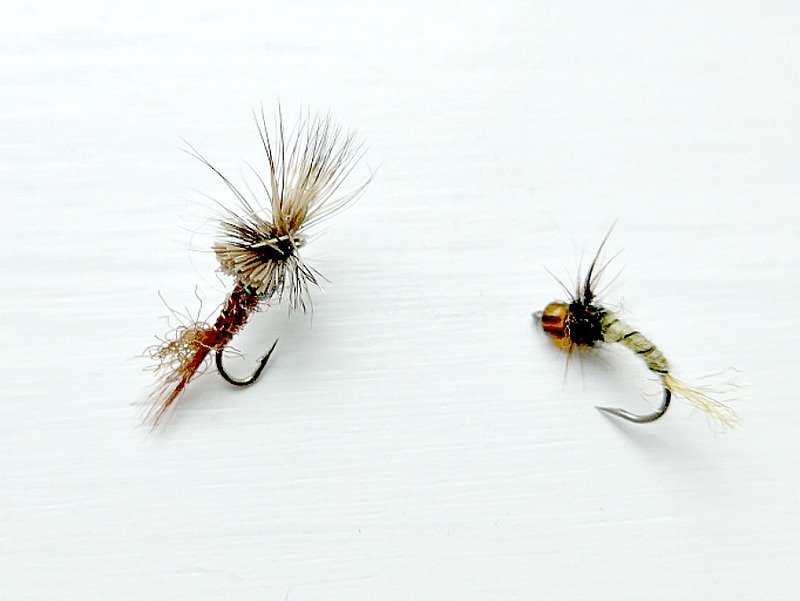 Below are pictures of two patterns that I tie and fish, the bowtie midge, and a Quigley cripple. Both patterns can be fished dead drift. I usually drop them off a more visible pattern, such as a parachute midge-dun, and fish them the same as the mayfly-emerger patterns just discussed. So when should one consider fishing an emerger? Much has been written about trout riseforms, and the helpfulness of distinguishing them. With true surface-takes of duns, the trout’s head breaks the water’s surface. With subsurface-takes of emergers, only the trout’s dorsal or caudal fins break the surface. This is most helpful when working on an isolated fish in a quiet spring creek. But I don’t find it as helpful when fishing a hatch on a freestone stream, where the rougher surface often masks the riseforms. Therefore, when fishing a hatch on a freestone stream, I almost always fish two patterns together, a dun and an emerger. For subsurface emergers like the bowtie midge, I drop the emerger off the bend of the dun’s hook. This helps keep the dry fly positioned properly on the surface. 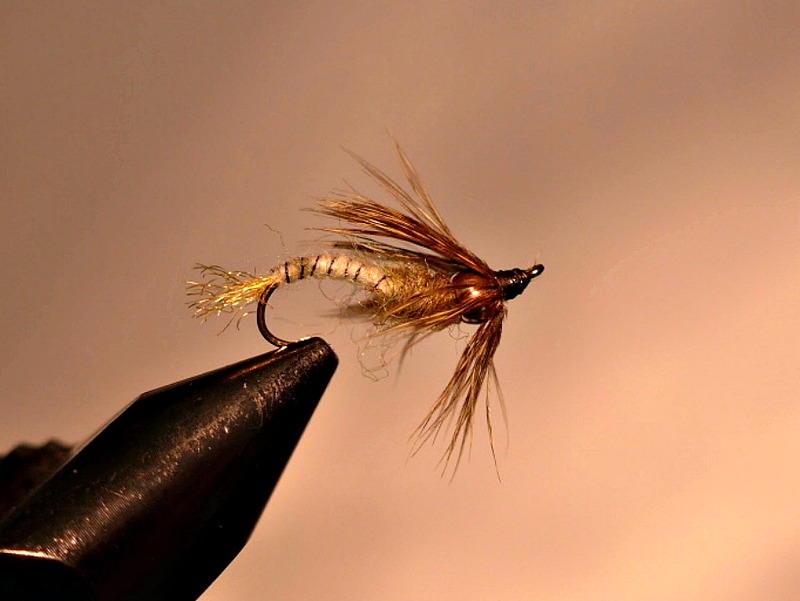 For floating emergers, like the Quigley cripple, I drop the emerger off the eye of the dun’s hook. I think this reduces tangles and keeps the tippet from interfering with hooking a fish rising to the dun. In my experience, far more fish will take the emerger than the dun, especially the big, fussy ones. When fishing a hatch on a spring creek or tailwater, I begin with a dun pattern if the riseforms suggest surface-feeding. But if faced with refusals of my dry fly, I will first add an emerger rather than changing the dry fly. This will usually result in strikes. Fly fishing emergers during a hatch will significantly increase the number of trout you put into the net. It will also increase your chances of catching a large, trophy trout. You should give it a try! “Fly Fishing Midges in Winter“, posted January 2015 “Emergers“, by Doug Swisher and Carl Richards, published 1991.
written by Al Simpson, July, 2016.